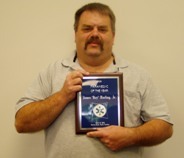 SCC Corporate & Community Education’s EMT-Basic instructor, Ray Harling, was the recipient of the 2010 Paramedic of the Year award at the SC EMS Symposium at Myrtle Beach, SC. This is a very deserving award for Ray. Congratulations, Ray! Spartanburg, S.C. – Spartanburg Community College’s (SCC) Department of Student Disability Services is partnering with the JC Stroble Glaucoma Awareness Foundation to host a Disability & Health Awareness Fair to provide information and resources to students with disabilities seeking higher education degrees, diplomas and certificates. The Disability & Health Awareness Fair will be held on Thursday, April 14 from 10 a.m. to 4 p.m. in room 115 of the Health and Science Building on SCC’s central campus in Spartanburg. The event is free to the public and offers free health screenings, food and beverages to attendees. Special guests include JC Stroble, Spartanburg’s famous Beacon Drive-In caller, and local musician and singer, Clifton Reeves, of G-Risen of Most High Productions. Because of this, Mrs. Stroble-Ross felt a desire to educate the public about glaucoma and the various ways the disease can be prevented and treated. A 2010 graduate of USC Upstate graduate with a business degree in nonprofit philanthropy, Stroble-Ross says she enrolled in the University’s nonprofit program in January 2007 with her father and glaucoma in mind. “I felt that obtaining this degree would further the advancement of the Foundation and better enable me to serve my community,” she adds. Clifton Reeves, a 2004 SCC graduate and 2010 USC Upstate graduate, will also attend the fair and share his life experiences of living with blindness. “Clifton has never let his blindness stand in the way of his achieving goals and dreams, “ says Brantley, who worked with Reeves when he attended SCC. “In fact, I’d say that his blindness has only made him more determined to succeed and make a difference in his community.” Reeves is owner of G-Risen of Most High Productions, a music production company he founded because of his love and talent for music. Local community healthcare providers attending the fair include S.C. Commission for the Blind, Spartanburg Vision and Spartanburg Regional Medial Center (SRMC). Attendees may take advantage of free blood pressure screenings by students in SCC’s Medial Assisting Program as well as healthcare professionals from SRMC. For more information about the The Disability & Health Awareness Fair at SCC, please contact Kiki Stroble-Ross at (864) 266-8406 or (864) 585-5030. To learn more about the JC Stroble Foundation, visit www.jcstroblefoundation.org. For more information about SCC’s Student Disability Services, please visit the SCC website at www.sccsc.edu/resources/disabilities. Registration for SCC summer and fall classes is ongoing and summer classes begin on May 16. Individuals interested in applying to the College for the summer and fall semesters can apply online at www.sccsc.edu or contact the SCC Admissions Center in Spartanburg at (864) 592-4800 or toll free (866) 591-3700. For a complete listing of summer and fall class schedule offerings, visit www.sccsc.edu/academics/search.aspx. About the JC Stroble Foundation. The JC Stroble Glaucoma Awareness Foundation was created to save the next unaware victim from blindness caused by ocular diseases such as Glaucoma. Launched on the USC Upstate Campus on April 11, 2008, by Jekeithlyn “Kiki” Stroble-Ross. Mrs. Stroble-Ross is the daughter of JC Stroble, the legendary caller at the Beacon Drive-In. For more information, visit www.jcstroblefoundation.org. Spartanburg, S.C. – Spartanburg Community College (SCC) will hold a chartering induction ceremony of the College’s new chapter of Phi Theta Kappa today at the SCC central campus in Spartanburg. This international honor society for two-year colleges is the largest honor society in American higher education, and SCC will induct 149 students who have completed a minimum of 12 hours of associate degree course work and earned a grade point average of 3.5 or higher. The ceremony is this evening, Friday, April 8 at 7 p.m. in the Tracey Gaines Building Auditorium. When: Friday, April 8 at 7 p.m.
Press Opportunities: Speak with a diverse group of successful, non-traditional students about the challenges of meeting high academic standards while managing work, family and other life circumstances. Recently named one of the fastest-growing colleges in the nation according to Community College Week, SCC offers more than 100 academic programs of study including associate degrees, diplomas and certificates, plus University Transfer opportunities to four-year colleges and universities. SCC provides flexible class scheduling including day, evening, weekend and FlexStart classes in addition to more than 100 online classes through SCCOnline. Offering the lowest tuition in the region, convenient locations, and regional/national accreditations, SCC offers educational opportunities leading to high-growth, high-demand jobs. The SCC Corporate & Community Education Division provides job and career enhancement, workforce development and personal enrichment courses and training programs. For more information, visit www.sccsc.edu. SCC Corporate & Community Education Classes Available Now! Our EMT programs are DHEC recognized and taught by some of the most experienced instructors in the field. Last year our own Evelyn Squires received “Instructor of the Year” Award’ at the EMS Symposium in Myrtle Beach. Our 911 Telecommunicator program is the first of its kind in the state. Designed by the Deputy Director and Training Coordinator of the Spartanburg County Office of Emergency Services, this is the most comprehensive program for the 911 Telecommunicator. National certifications include APCO, the Association of Public Safety Communications Officials, and ETC, the Emergency TeleCommunicator. Instructors are experts in their fields from Emergency Management, Fire, HazMat, Law Enforcement, and more.